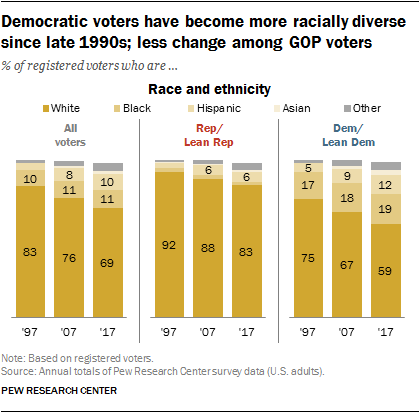 Racial diversity by political party, 1997 to 2017. Source: Pew Research Center. (RNS) — Republicans have a lot to worry about in this midterm election year, strapped as they are to a deeply unpopular president and facing a possible “blue wave” at the polls in November. The Pew Research Center recently released a report on party identification based on more than 10,000 interviews with registered voters in 2017, and found that 50 percent now identify as or “lean” toward the Democratic Party — the first time since just after President Obama’s election that Democrats have crossed that magical 50 percent barrier. This compares to 42 percent who identify as or lean Republican. But that short-term situation is not the worst news the report contains for the Republican Party. The long-term outlook for the GOP is alarming based on four major demographic trends that do not favor Republicans. 1. Republicans do well with religious voters, but the nation is becoming less religious. Two things are going on here. 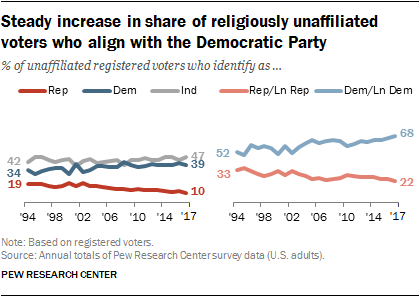 The first is that the so-called nones — the religiously unaffiliated — are growing as a share of the voting population. In 1997, says Pew, nones were only 8 percent of the electorate. Now they’re 24 percent, triple their numbers of two decades ago. Meanwhile, Republicans’ core audience of white Protestants is shrinking as a share of the overall population. Whether these nones will in fact vote is another story. In the 2016 election, when they made up 21 percent of the potential electorate, they represented only 16 percent of Americans who voted. This very diverse population is difficult to unify into a voting bloc, say experts. So if there’s a silver lining for the GOP, it’s that nones have yet to make their full power felt at the polls. 2. Republicans aren’t keeping pace with the nation’s growing racial diversity. In 1997, 83 percent of American voters were white. Twenty years later, it was 69 percent. What’s more, the nation is predicted to become “minority-majority” sooner rather than later. In 2060, whites are projected to be less than half of the U.S. population. The population as a whole is not the same as the pool of registered voters, which tends to be a little less racially diverse, but the basic trend line is clear: America gets a little more diverse with every passing year. Both parties have also become less white over time, but Republicans’ inroads with voters of color have been unimpressive. The GOP is still 83 percent white, while the Democratic Party is 59 percent white. In other words, the GOP’s racial diversity mirrors the electorate’s … of 20 years ago. 3. Republicans aren’t getting any younger. Republicans should be concerned that millennials are showing almost a 2-to-1 preference for the Democratic Party: 59 percent versus the 32 percent who prefer the GOP. The gap is particularly pronounced among millennial women, 70 percent of whom now identify as or lean Democratic. People tend to get more politically conservative as they get older, though, so how can we know that this is a genuine “cohort effect” and not just an age effect that pertains to millennials right now because they’re young? Looking at Pew’s longitudinal data from 1994 may call into question the old adage that people inevitably get more conservative as they age. 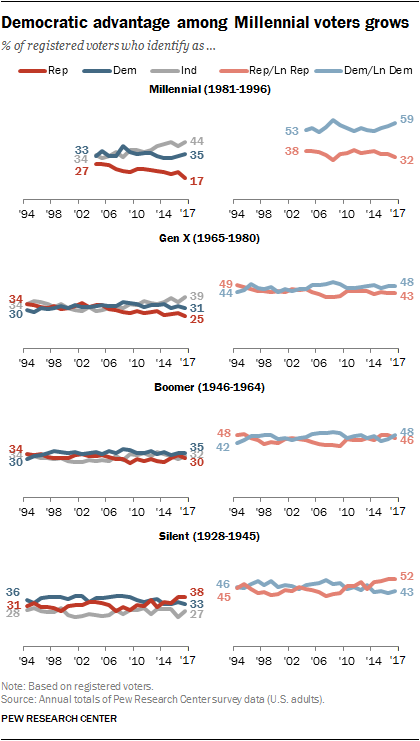 The only generation that is more Republican now than it was in 1994 is the Silent Generation (born before the end of World War II). Baby boomers, Gen Xers and millennials have all moved away from the GOP, millennials rather dramatically so. The effects of this are far-reaching. To be blunt, members of the Silent Generation are dying every day. The fact that the GOP has failed to retain the loyalty of any younger generation does not bode well for the party’s long-term future. 4. College-educated voters are turning to the Democratic Party. 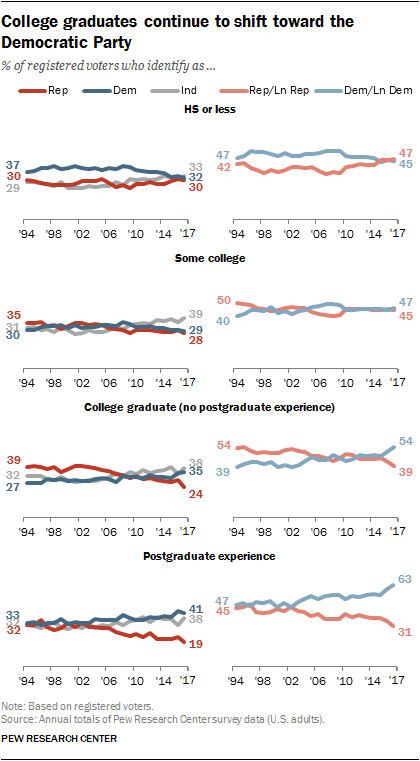 In 1994, 39% of those with a four-year college degree (no postgraduate experience) identified with or leaned toward the Democratic Party and 54% associated with the Republican Party. In 2017, those figures were exactly reversed. The GOP’s appeal has increased among voters with only a high school education, especially white ones. The problem for Republicans is that Americans with a college education are growing as a share of the population: According to the U.S. Census Bureau, the ranks of the college-educated have risen slowly but steadily in recent years, from 28 percent in 2006 to 30 percent in 2010 and 33.4 percent in 2016. In general, then, Republicans are succeeding with older white Christian voters who have less than a college education. The problem for them is that these voters are fast becoming thin on the ground. Sorry, but I’m not worried at all. (1) Nobody with any common sense would dare to put their faith in the American (or any other) political system. Government and Politicians and Always-Biased Media cannot save you from economic, military, or natural disasters and hard times. (2) Can’t tell how any election season will go. (3) Trust God instead. Elect Jesus. Great article. Love the insights. I hope that these trends either moderate the GOP or make way for a replacement (or maybe even replacements) for the GOP. One question though: doesn’t this article seem out of place for this column? There is a replacement. It is called The Democratic party! This demographic voted for Trump. But I wonder if they would have shown up to vote for Ted Cruz, or if they’ll show up to vote for any other “establishment” candidate? Every single election season, all sides, all candidates, promise all the voters “a chicken in every pot” (remember that one?). And if you don’t make that promise, you lose. So, did you, umm, vote for Hillary in 2016? She sure had her big promises, (just like her boss Obama and her opponent Trump), did she not? There is a big difference between cynicism with the system and actively supporting a dumpster fire of a politician. My guess is that North Korea would have annexed the White House by now, if Hillary was President. Cruz, yes, establishment candidates, no. Well, they would but not in enough numbers to make a difference. I call bull sheeyit on that. Show the math. LOL! South Korea and China cut the US out of negotiations because they both thought Trump was too stupid to be involved. China defused the situation in the worst way for Trump. By pledging to protect the Norks with their own nuclear weapons. Republicans are slowly dying demographically which is why they have to rely on aggressive voter disenfranchisement and gerrymandering. Is the republican party your tribe,come hell or high water? Absolutely not. It’s not a binary choice. What does that even mean in real terms? Much as I love Jesus, I can’t vote for him. He isn’t a U.S. citizen. I don’t put “faith” in politics of any kind, but I do try to be as conscientious a voter as possible in an imperfect system. Sometimes that means voting for the best candidate and sometimes it means voting for the least bad. Such is the human dilemma. Not with the direction the New Left is taking the party! I always vote the candidate and never the party. Republicans also have more kids and people become more conservative as they age. I know the “historical inevitability” argument is popular among liberals who are trying to grab onto something to feel good about when they seem unable to win even basic legislative or electoral battles, but if you’re going to make demographic prognostications you should at least see what the literature says: Kaufmann, Eric, Anne Goujon, and Vegard Skirbekk. “American political affiliation, 2003–43: A cohort component projection.” Population studies 66, no. 1 (2012): 53-67. HEADS OR TAIL, you mean? Get real. There’s no pattern or science to presidential partisanship. Since Franklin Roosevelt there have been 7 Democrats and 7 Republicans running the White House Plantation. The 45th US Prez is Republican. It’s a 3 day term, after which he retires and collects benefits for forever. Jesus was chosen by his Father, or God, to be the King (Isaiah 9:6,7) of God’s kingdom, or heavenly government (Matthew 4:17). That heavenly government will soon replace all human governments (Daniel 2:44) and directly rule over all mankind (Isaiah 11:1-5) for 1,000 years (Revelation 20:4-6). That rule will put an end to inherited sin and death so that mankind may finally live forever on a paradise earth. My vote has always been for God and his government.???? Look up the definition of “soon”. Time’s up. “Soon” has come and gone. “Inherited sin”? Thanks a whole bunch. This is a sickness that can only be cured by loving the one who gave it to you. If it were true, I’d call it evil. Jesus gave us the “signs” that would indicate when we were living in the “last days” of a wicked era. These include increase of lawlessness, nation against nation, wars, pestilence, love of the greater number being cold, earthquakes in one place after another, and fear of the things happening on the earth (Matthew 24; Mark 13; Luke 21), which have seen major fulfillment since 1914, starting with the First World War. This world is still in a mess that is only increasing on a daily basis .Jesus further indicated that the good news of God’s kingdom would be preached in all the inhabited earth before this wicked era ends (Matthew 24:14), which is still being done. Because of our first parents’ disobedience to God, they sinned and died. We have inherited that death sentence as well (Romans 5:12), which is why God made a way out of that sentence through the ransom sacrifice of his perfect son, Jesus (Matthew 20:28) for imperfect humans. That is not only true evidence of God’s intense love for the human family, but also by his son, Jesus, who willingly gave up his life and suffered greatly until his death. God is not slow, he will take action at his perfect time, and all of his promises above will come true, whether we believe them or not. I know all this, but I don’t believe it. If Eve was created from Adam’s rib, they would have the same DNA (clones) and could not reproduce. “Our first parents” never existed. Inheriting death is completely unreasonable and unfair. Jesus was dead for three days. He gave up three days of life on this planet. Big deal. MANY people have given up much more, and for much less. Many firefighters and cops died in the twin towers trying to save people. They gave up a lot more than just a weekend, and they weren’t trying to save people for eternity. They just wanted to save them for the few more years they might have had here on Earth. It’s all nonsense and it’s the main source of division on the planet. Both Adam and Eve were directly “created” by God and became human souls (Genesis 2:7; 20-23; their children were not, but instead were “born” on this planet. Adam and Eve had sexual relations and Eve became pregnant; giving birth first to Cain, and then to his brother, Abel (Genesis 4:1-2). The sons evidently acquired DNA from both their parents, and further children were born as well, acquiring their own DNA. If Adam and Eve had refused to eat fruit from a certain tree, which God commanded they should refuse to eat as a test of their obedience (and Satan told Eve that it was a lie and they would not die), they would most likely still be alive on earth, and the earth comfortably filled with all their offspring (Genesis 1:28), with everyone in a perfect state, as Adam and Eve had been to begin with. But that didn’t happen! ???? And what God did to accomplish his goal for mankind, in spite of their disobedience and sin, was previously explained. Because of the ransom sacrifice of God’s son, Jesus, millions of persons who have lost their lives through the ages, will be resurrected back to life on earth, and reunited with their family and friends (John 5:28,29) throughout Jesus’ upcoming 1,000-year rule. That will happen even if firemen were trying to save lives, but couldn’t, and no one made it out alive; even if they were all killed in the Twin Towers one horrendous day; even if they were killed by an earthquake or by the Titanic sinking; by cancer of any sort, or just plain old age. Even people who have had no opportunity to learn about God and his son, Jesus (and eventually died), will be given the opportunity to do so, through resurrection (Acts 24:15)!! What human or human government can do ALL these things?????? It is human imperfection and imperfect human rulership (which is corrupt, selfish and greedy), as well as the influence of Satan the Devil, the God of this world (who now knows his time left to deceive mankind is short), that now divides the entire earth. And that division will only continue to get worse, as time goes on, UNTIL God intervenes! No integrity for Trump’s evangelical disciples. Sad!